Exterior siding is a classic and popular choice for many homeowners these days, but it can be prone to staining and damaged by impact or temperature extremes, leaving your entire property looking seriously weathered and less than stellar. If your siding has been dented, cracked, or even melted, you need to call Northshore Window and Siding ASAP! We can repair or replace your exterior siding in next to no time and get your whole house looking crisp and stylish again. 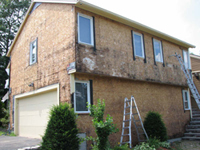 To learn more about our professional siding repair, give us a call today! Despite its widespread appeal, siding isn’t always as durable as many property owners would like to believe. Vinyl siding in particular is susceptible to cracking. And, as you know if you’ve ever left the barbecue too close to the house, vinyl can also melt when subjected to high temperatures. Aluminum siding can dent rather easily, and cement fiber siding can actually chip. But damaged house siding doesn’t mean you have to go to the expense of all-out replacement! No matter what type of siding you have, Northshore Window and Siding has the specialized knowledge and skill to provide siding repair or partial replacement of any damaged sections. That way, you can get swift, seamless restoration of your home’s appearance at a fraction of what you’d pay for a total siding installation. Experience is key when it comes to your house siding repair or replacement. While many other siding contractors only offer installation services, Northshore Window and Siding goes above and beyond to address the unsightly buckling and cracking that can affect your home’s aesthetics. If the damage can’t be mended with siding repair, we’ll actually remove the defective section of siding and replace it with a matching piece, leaving your whole house looking good as new. Plus, since we’ve been working with exterior siding for nearly three decades now, we won’t make DIY mistakes like accidentally cutting nearby pieces of siding or incorrectly installing replacement sections. You can trust our professional siding contractors to do away with the damage effectively and efficiently, securing a beautiful, expert siding repair or replacement! If you have portions of siding that are buckled, melted, or cracked, don’t hesitate to contact Northshore Window and Siding before any more damage is done. 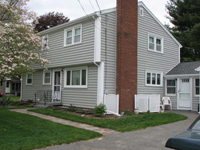 Wherever you reside in the Boston area, our exceptional siding contractors are only a phone call or e-mail away.